There are many roofing materials on the market that offer different benefits; however, roof coating systems and spray polyurethane foam (SPF) roofing systems are able to provide a 100% monolithic and seamless membrane. The benefits of a seamless coating system are quite simple. These flat roof materials have no joints, no seams, and no penetrations. This is beneficial because often times roof failures occur due to the lack of flexibility the roof membrane is able to provide over the years. As outside temperatures change from cold, to hot, back to cold during a single day, the building and roof expand and contract during those fluctuations. As your roof ages, it becomes brittle and loses it’s ability to remain flexible. So then as the building expands and contracts, the roof has a hard time keeping up with the movement causing a bulk of the tension to occur at the areas of joints, seams and penetrations. The isolated tension and deterioration of the roof causes these areas to ripe and tear, leading to water penetrating into the building. Seamless membranes are able to handle the additional stress from the temperature fluctuations as the tension is spread across the entire rooftop evenly. Roof coating systems and SPF roofing systems not only have no seams or penetrations, but they have a built in added protection to prolong your roof life. The white reflective coating used in a roof coating system and on top of a SPF roofing system, reflects a majority of the sun’s heat away from the building, protecting the roof from the sun’s heat, which is the leading cause of roof deterioration that causes the roof to lose it’s flexibility. The other very beneficial thing about seamless coating systems is its ability to be spray applied. Most flat roof materials are rolled out onto the rooftop and are cut into place, drilled and nailed down or welded around seams. 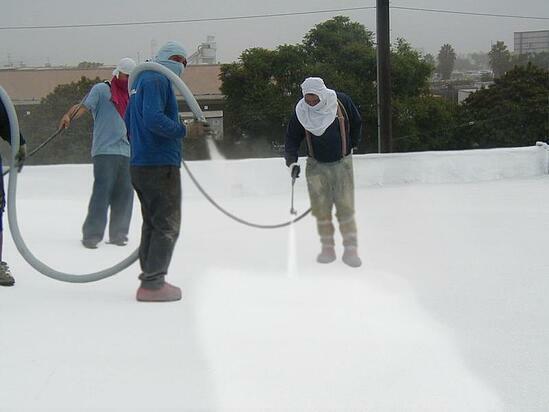 This process is cumbersome as many roofs have multiple items on the rooftop that need to be properly cut around and sealed such as HVAC equipment, pipes, drains, etc… A spray applied roof membrane is simply applied around rooftop equipment just the same as it is on open areas of the roof – sprayed. This allows for ease of application, quick installation, and the ability to waterproof those hard to reach areas without any extra time or work. For more information on seamless coatings systems, download our Full Product Brochure. For information on SPF Roof Systems, download our SPF Brochure.